A monthly card making kit club is a company that provides you with a “kit” that is automatically delivered each month and includes everything you need to make handmade cards for that month’s theme. 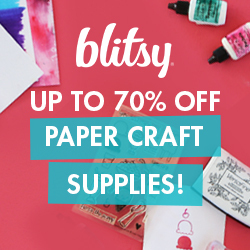 They usually include some or all of the following: cardstock, patterned paper, stamps, embellishments, inks, etc., all for one monthly fee. Annie’s CardMaker Kit of the Month Club – Each month you will receive enough product to make 8-10 cards. The cost is $18.99 plus shipping (unclear as to the cost of shipping). According to their website, you can cancel at any time for any reason. Club Scrap Card Kit Clubs – This company offers two (2) different types of card kits each month. The first is called “Club Stamp” and the second is “Greetings to Go”. Let’s talk about Club Stamp first. The cost is $21.95 plus $7.95 shipping and each month you receive enough product to make 12 cards, including a stamp set. You can use the products included to create your own cards and projects. With Greetings to Go, which is more of a “Cut, Fold, Assemble” type club, the cost is $15.75 plus $7.95 shipping and each month you receive 12 card bases and panels, cut-a-part greetings and images, enough product to assemble 12 cards. Deena Ziegler Card Kits – Creative Cards Monthly Subscription – When you subscribe you get Free Shipping on your monthly kit and a 10% discount on all other products. The kit is $20.00 a month. Find out more here. Fun Stampers Journey Kit of the Month – This kit offers an exclusive stamp set, pre-cut elements, coordinating embellishments and step-by-step instructions each month for $24.95 plus shipping and tax. There is a 6 month commitment. Gina K Designs / Stamp TV – Gina K. Designs has the StampTV Kit and a new Mini Kit too! StampTV Kits are $59.95 and have two 6 x 8 stamps sets, card stock, a patterned paper pack, dies (or sometimes other items that coordinate) and comes in a storage box. Our new Mini kit has a stamp sets, cards, envelopes, layering pieces, 6 ink cubes, an acrylic block and a tape runner, all for $39.00. Hero Arts has a new monthly kit called “My Monthly Hero” which includes products such as a stamp set, ink pad, and other crafty goodies. Each month you visit their website and purchase the kit (they have a limited number of kits for sale) and they ship it to you. The cost is $34.99 and they offer “add-ons” for an additional costs. 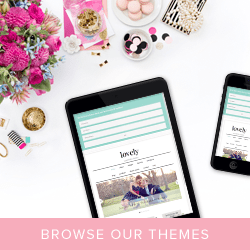 My Favorite Things – No subscription required, kits are sold each month and once they sell out, they are no longer available. However, approximately six weeks after the kit is released, the individual products will be available to purchase on their site. Kit Prices range from $54.99 to 64.99. With each kit you will receive a PDF file that includes a list of items included in the kit, as well as a variety of inspiring cards our team has created with the kit. Paper Wishes – Cardmakers Personal Shopper Subscription Boxes – For $19.99 plus $4.75 shipping each month, this kit includes enough product to make 10 cards. There are no long term commitments and you can cancel at anytime. Simon Says Stamp – SSS offers a monthly card kit for $24.95 a month. In my personal opinion the card kit is packed full of product for the price and you always get an exclusive SSS stamp set. The price for non subscribers is $29.95. You can cancel at anytime without penalty and you can skip a month if you don’t care for the kit. Spellbinders Maker’s Mart Card Kit of the Month Club – For $35.00 a month with FREE SHIPPING! There is enough product to complete ten cards with a minimum of 45 pieces per kit. There is a three month commitment which you can cancel at anytime. Each kit includes etched dies! Subscribers will receive a 25% off coupon each month to be used in the Spellbinders online store! Stampin’ Up Paper Pumpkin – This monthly “project” kit costs $19.95 including shipping fees. You can either purchase the kit each month with no commitment, or you can sign up for a 3, 6 or 12 months subscription. The only “downside” to this kit is that you don’t know what you are buying each month because there are no “previews” or photos of what the current month’s kit includes. It’s meant to be a “surprise” type of box. However, if you are a fan of Stampin’ Up’s products and project styles, chances are that you will probably like it. 🙂 You do not “need” a demonstrator in order to purchase the kit because you can always search the site for one when you are buying the kit. Stamps of Life Card Kit – For $39.98 a month (including shipping in the US), you will receive enough product to create twelve (12) cards. There is a three (3) month commitment. Here is a video showcasing their kit club. They also offer monthly “stamp” and “die” clubs as well. Uniquely Creative Card Kits (Australian based club) – The Main kit retails for $49.95 and subscribers save 10% which bring them down to $45.95. Their kits are a real craft class in a box which include a professional instructions magazine induced with each kit. MayMay Made It‘s Stamp of the Month Club – Receive one 4×6 stamp each month for$11.99 (US), $13.49 (International) and she also a heART Scripture stamp subscription as well, at the same price. Spellbinders Marker’s Mart DIE Kit of the Month Club – For $12.50 per month you will receive an exclusive set of versatile dies that cut, emboss, deboss and stencil. Only Available to Members! Also a three month commitment which can be cancelled at anytime. Subscribers will receive a 25% off coupon each month to be used in the Spellbinders online store! Green House Society – Monthly Stamp Club for those who love floral images. 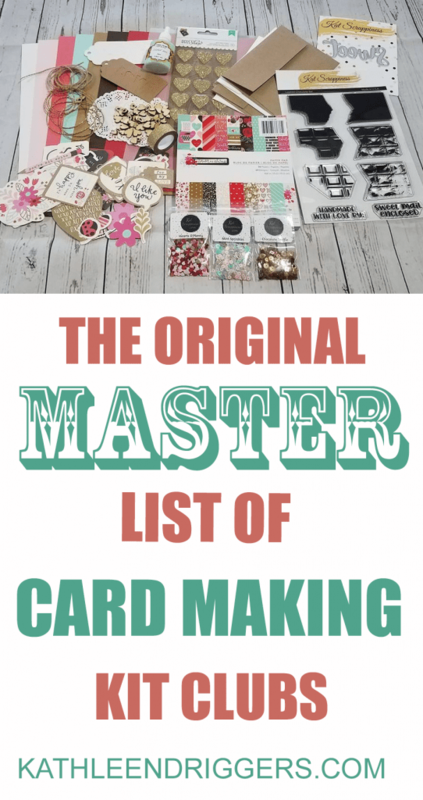 If you are aware of any additional monthly card making kit clubs that are not listed here, please leave a comment or message me with the information and I’ll be happy to add it to this list. Thank you for this, Kat! I love these monthly clubs. I also belong to some monthly stamp clubs (no paper or embellishments), monthly die clubs and even one that offers a stencil. If you are interested info for a post on those, let me know. I think studio calico offers a card type kit. Thank you for this list. My mom has been having a harder time getting out to craft or shop. I have been thinking of getting her a kit for Christmas. Thank you! I will research it and add the information to my list! Studio Calico has converted their card kit to a stationary kit. It comes with pre-made 1 layer greeting cards and 1-2 small embellishments. Thanks, I’ll update this post with the new info asap. Thanks! I am very intrigued by the SSS kit! JBS also has a kit club- JBSmercantile.com I used to subscribe. Jennie Bowlin. They are listed there Jean M 🙂 Thanks though! Hi Kathleen! Thank you for including Hero Arts in your list! Just a quick update – the Hero Arts kits are typically $29.99. We only had one higher priced kit back in November. Thank you!! Thank you! I will add those as soon as I have time! How wonderful that you put this list together. Thank you ever so much. Was looking for a list of kits and found this! PERFECT! Sparkle N Sprinkle has a monthly card club as well. Year Commitment, but can pass on kits if not interested and just extend the time. I have been in this club for 2 years and love it. Thank you so much for putting this together! It is so helpful to those of us who live in areas with very limited craft supply store options. Darcie’s heart and home has a bi-monthly stamp kit. I think Avocado Arts are no longer a crafting related website… Their sole illustrator and product developer, Lisa Hetrick, left the company to launch a new company, also non-crafting related. But hey, I may be wrong. The link provided above now leads to an Android app making company. We would love to be included! Gina K. Designs has StampTV Kit and our new Mini Kits too! StampTV Kits are $59.95 and have two 6 x 8 stamps sets, card stock, a patterned paper pack, dies (or sometimes other items that coordinate) and comes in a storage box. And forgive all my typos! I was thinking faster than I could type! LOL! Where can we find your StampTV Kits? I can only find your Mini Kit (Sentimental Bouquet) on your website. Thanks! I was looking for a monthly kit to feed my craft addiction overseas – seems like the MayMay one ships internationally? Fantastic! Thanks for the help! Hero Arts Monthly Kit is what I would get. Scrapbook Generation has several monthly kit clubs including a card kit for $12.99. The card kit features newer paper company products. Gorgeous designs. Technique Tuesday still has c,UBS but they call them auto ship programs where you get a stamp and die set. They have 3 that I know of: memory keepers, greenhouse and animal house. Thank you for this listing of kits! I have been looking for this information for a long time. So glad I found your site! I just a cute and pretty amazing kit from “Queen & Co.” Lots of good reviews. There is a stamp club that offers a variety of vendors, rather than just one vendor. Does anyone know the named of that one? A lady at the last stamp convention in Columbia, SC told me, but I did not have anything to write the name with. Thank you sooo much for this overview. Have you updated this since it was posted some time ago? Unfortunately paper wishes no longer has their monthly clubs. They are reorganizing to go into an amazon marketplace.